Alessandro Petacchi’s retirement was short-lived, as the 39-year-old Italian has inked a contract with Omega Pharma-Quick Step that will keep him in the peloton at least through 2014. Petacchi, who started the season with Lampre-Merida, announced his retirement in April after a professional career that began in 1996. A prolific sprinter, Petacchi won 22 stages at the Giro d’Italia, 20 at the Vuelta a Espana, and six at the Tour de France. He won the points classification one time at each of the three grand tours. Days after his retirement, Petacchi was in contact with Omega Pharma about signing with the team, but he was not allowed to hop over to the Belgian squad because mid-season transfers are not allowed before August 1. Petacchi had hoped to ride on Omega Pharma’s Giro d’Italia and Tour de France teams as a leadout man. 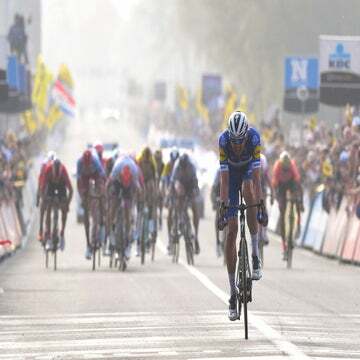 In his new role, first reported by Sporza, Petacchi will be the final rider in Mark Cavendish’s leadout train. 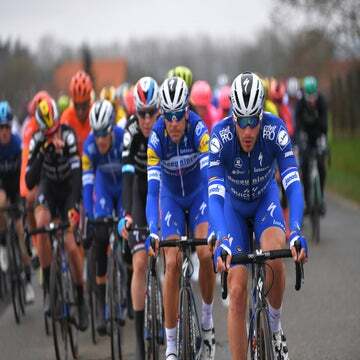 He’ll race some criteriums in the coming days before making his official return to the peloton at the Eneco Tour, a seven-day race that cuts through Belgium and the Netherlands, starting August 12. Petacchi was adamant that he truly intended to retire from the sport when he left Lampre; some people questioned his motives because of the near-immediate contact he had with Omega Pharma. Known as “Ale Jet,” Petacchi’s grand tour stage victories total would have been higher had he not been stripped of five wins from the 2007 Giro d’Italia when he was caught doping. He was banned for a year in 2008 by the Court of Arbitration for Sport after testing positive for salbutamol, despite the Italian Cycling Federation originally exonerating him. He also won Milano-Sanremo in 2005 and Paris-Tours in 2007.